An electric fireplace in a bedroom can be a dream come true. If you have ever dreamed about having a gas or wood burning fireplace in your bedroom but had given up on it please consider an electric fireplace for your bedroom. You can enjoy all the perks of a fireplace without the cost, installation, or maintenance of a traditional fireplace. Just think about the relaxing cozy (and possibly romantic) ambiance that can easily be created. Electric fireplaces can smooth the journey into sleep. In this post we wanted to open you up to design possibilities and possibly remove some barriers and objections you may have had in the past. Without further ado – Let’s Browse…. 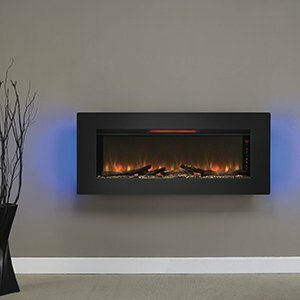 An electric fireplace that is wall-mounted is also a great option because of its design flexibility. While it favors modern or contemporary settings the surrounds are commonly available in black or white which favors just about any decor. Make certain you investigate all the colors and sizes available in the model that you like. Helpful Tip: Take some string, and thumbtacks or scotch tape and layout the rectangular shape of the electric fireplace right on the wall. Take the dimensions from the product description. This will help you visualize the exact size and placement location. Often the images shown can make it look smaller or larger than it really is. Designed For Flush Mount – Not Wall Hanging PuraFlame 50″ Alice In-Wall Recessed Electric Fireplace, Touch Screen Control Panel. Helpful Tip: There are some wall mount electric fireplaces that come with a stand. Just pick it up and place it wherever you want on a dresser or end table or in a book nook. Update: We JUST discovered a 5 star budget friendly wall mount or stand alone fireplace (stand included) You have to see this. The first image below is the PuraFlame 36″ Galena, Portable or Wall Mounted, Flat Panel Electric Fireplace with Remote it has lots of positive reviews and is certainly worth a look. PuraFlame 36 – top/floor stand and wall mounted brackets included. Della 37 – Stunning wall mount/tabletop electric fireplace. Able to install on a wall or tabletop feature with the included base. Best Choice Products – Budget Friendly. Low Price. You have the option of mounting to a wall or attaching the included base for a freestanding style. Why Have An Electric Fireplace In Your Bedroom? If you have ever dreamed about having a gas or wood burning fireplace in your bedroom but had given up on it please consider an electric fireplace for your bedroom. You can enjoy all the perks of a fireplace without the cost, installation, or maintenance of a traditional fireplace. There is no need for a chimney or venting. The bedroom is an ideal application for an electric fireplace in terms of zone heating. As almost all electric fireplaces are rated to heat 400 ft.² this is more than adequate for keeping your bedroom toasty warm. They are perfect solutions for zone heating plans They generate a cozy, mesmerizing, atmosphere that is great for getting to sleep or a little romance. You can control the brightness, intensity, and in many cases color of the flame effects being produced to suit any mood. Although electric fireplaces have many different styles and configurations we would recommend a wall-mounted or mantle electric fireplace for the bedroom. A wall hung electric fireplace has an advantage in being able to be mounted at any height so that viewing from the bed is possible.